I’ve just returned from the scene of a conundrum — Styrofoam in the marine environment. 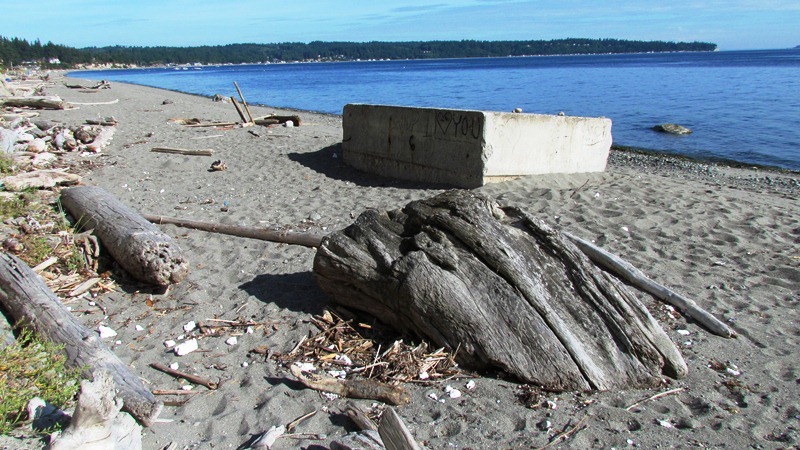 A Styrofoam filled dock tossed up on a Puget Sound beach. 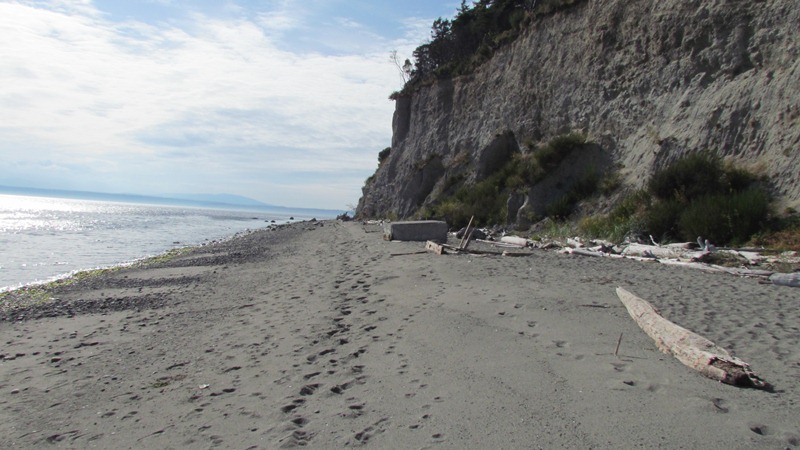 A few days ago a Whidbey visitor left a comment here on Tidal Life to tell me that a section of dock had floated up and lodged on a local beach. They asked for my help finding the correct agency to remove it. While I was flattered to be considered a possible source of information and help, I didn’t have much to offer right off. I promisee to make some calls. Which I’ve done. With little success. In itself, a wayward dock washing up on a beach is not an event. Floating debris is continually swapping around in Puget Sound. Docks, floats, buoys and boats break away from their moorings all the time. Heck, I’ve even seen a car chassis washed up on a beach. What made this item different was the fact that a portion of the dock’s concrete outer skin was damaged and the Styrofoam – those puffy, air-filled pellets that keep most docks floating on the surface of the Sound instead of sinking to the bottom – is getting broken up by wave action, people and possibly even animals. Styrofoam is quite useful when it says where it belongs. Unfortunately, when it gets loose it breaks down into small, toxic particles. Fish and birds eat the pellets, thinking they’re food. That’s the real hazard of Styrofoam in the marine environment. So what do we do to stop this from happening in this case? Now that I’ve been there, I’m not so sure that’s the way to go. This dock measures 12 feet by 8 feet by 4 feet high. The concrete skin, which is roughly four inches thick, is also embedded with rebar and wire mesh. It’s a substantial fixture on the beach, and not a bad place to sit and watch fishermen, ships and sea gulls. The only real problem with it is this hole that will enable roughly 316 cubic feet of Styrofoam to leach out and fill fish bellies. The irregularly shaped hole gouged in the foam measures roughly two and a half feet by two feet by two feet. There may be a larger opening buried in the sand. If that’s true, and the gouge continues the full height of the dock then the chunk that’s been gouged in the Styrofoam block would measure roughly 2.5 feet by by 2 feet by 3.5 feet. Therefore, the dock has already released something like 17.5 cubic feet of Styrofoam pellets. At a wild guess, I’d say that’s about as much Styrofoam as there would be in 10 Styro ice chests, or several cases of Styro coffee cups. Knowing the devastating effect these products have on the environment, a lot of us have turned away from the use of those cups and ice chests. We now use reuseable mugs and quality ice chests instead, except in dire emergencies. This wayward dock seems to laugh at all our valiant efforts. Looking around, I see chunks of styrofoam strewn up the beach to the west about twenty feet and down the beach to the east about 100 feet. Riffling thorough the sand near the dock I found that pellets of foam have already incorporated into the beach. We’ve been trying to slow the flow of plastics into the sea with bag bans and bottle recycling efforts. Now economic turmoil has taken our eyes off the environment. That’s unfortunate enough, but at the same time, the economic downturn has shut off funds even to organize volunteers to take care of beach trash like this dock. The Department of Natural Resources, the sheriff’s office and Beach Watchers have all said they can’t do anything due to budget cuts. Island Citizens for Public Beach Access reminded me that because the dock has come to rest on private property no one but the landowner can legally go there and do anything at all. To coin a questionable phrase. 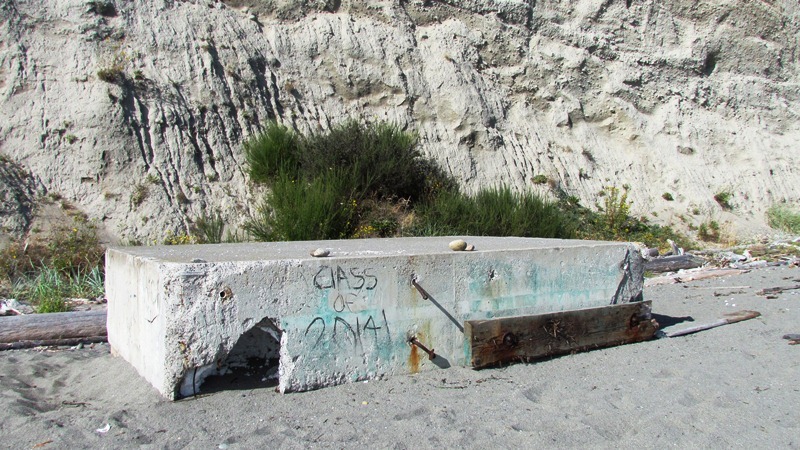 It may be that this was a private dock, which was not properly maintained or secured by its owner. Breaking loose, it came to rest on private property. However, in between, it passed through the public waterway, creating a hazard for many vessels, both public and private, and now it continues to threaten the health of a public resource. But there’s nothing the public can do about it. I see three potential fixes. Find the person who lost this dock and have them come get it. They may even want it back – it’s got to be far less expensive to tow it back into place and repair it than to build a new one. Offer it free to anyone who wants to tow it away and repair it. Repair it where it sits. Instead of breaking it up and hauling the pieces of concrete away, bring bags of concrete mix to the beach and patch the problematic hole. That’s probably the easiest and most sensible approach for these days. Anybody else have a better idea? Any idea if the dock is divided into sections? Maybe you don’t have to worry about the entire volume of styrofoam? I wonder if the loose stuff could be gathered (vacuum?) and broken down using limonene – http://m.wikihow.com/Reuse-Styrofoam – (assuming, of course, that you can actually get enough of the stuff to do this). I couldn’t tell from the outside, but you make a good point. In fact, does a single chunk of styro that large even exist? Perhaps the float is made up of three or four smaller chunks. That would help somewhat.